Yakitori. Ingeniously designed portable wooden swords of succulent chicken nestled between sweet, vibrant green onions. You can find it on just about every menu of every izakaya in Japan. Hell, you can find it on just about every menu in Japan that serves chicken. Yakitori is that popular. 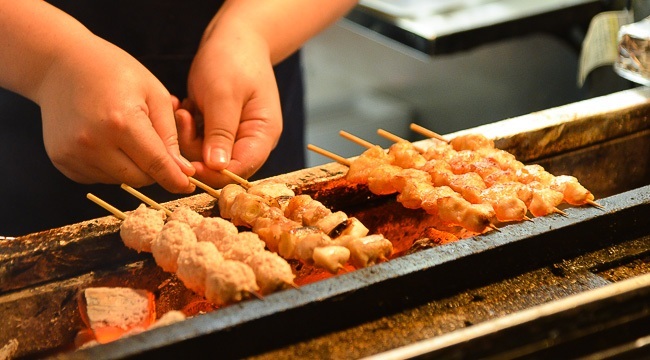 While you can get it here in the states, until you have tried it cooked over Binchotan charcoal by a skilled chef who specializes in yakitori, you have not tried real yakitori. Since I have been back to the states, sure, I have tried various types of yakitori at different restaurants. Delicious? Yes, but not on the same caliber at all. In my never-ending search to indulge in some authentically cooked yakitori, I even considered purchasing an expensive Konro Grill. But what if, there was a machine that could cook yakitori with the spin of a dial? You may be thinking, “Hey, this is missing one of the most important parts of well-cooked yakitori, the smokey flavor.” You are correct. But for the lazy among us, they are probably not complaining. What struck me about this video was not the machine itself, but the unique plates, glasses, and utensils that this guy has! I need that ketchup gun in my life! Check out Iseebitarou‘s Youtube channel for all sorts of unique Japanese gadgets! If you must have one of these machines in your life, it will set you back ￥5,980 over on Amazon Japan. Are you just looking for a great Japanese yakitori recipe? I would recommend this one from Nami over at JustOneCookbook! Are you sick of Sailormoon cosplay?